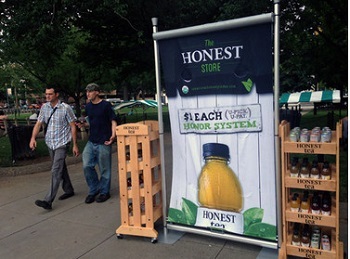 Honest Tea is out to find the most honest city in America as part of a new ad campaign for their line of bottled teas. For the campaign, they will be setting up displays of bottled teas in 62 cities across all 50 states. The displays will feature shelves and shelves of tea and signs that read “$1 each” – but the catch is that there will be no person there to collect the money. Instead, the booths will have drop boxes for dollars and operate on the honor system, allowing people to drop their payment into a box without anyone prompting them to. The little social experiment is meant for nothing other than promotional purposes, and Honest Tea will have people stationed inconspicuously near the displays to take notes on how consumers interact with the display, as well as noting how much tea is, or is not, paid for. So far, the company reports that the vast majority of tea – around 90% – is paid for by consumers, many of whom are worried abut being watched by hidden camera or otherwise “getting caught” for taking the tea without paying. How the rest of the experiment plays out, we’ll just have to wait and see. For more information contact Navori.